What does it mean to be a “human” animal? Pursue your interests with courses in French, Italian, Spanish, and Portuguese, as well as Polish language and Romance Studies Freshman Writing Seminars. 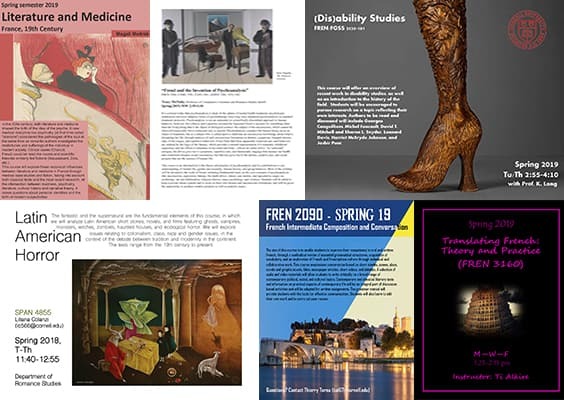 Our upcoming Fall 2019 courses span many topics—check them out at the links below! The J.G. White Spanish exam has been moved to *Rockefeller 112* today at 4:15pm! Thank you for supporting the Department of Romance Studies yesterday on #CornellGivingDay! We are very appreciative of your generosity and the opportunities these gifts allow us to create for our students!